Geese Guys is a perfect partnership between man and dog to humanely solve a geese problem. Geese like to gather in big, open green spaces, like parks, schoolyards, and golf courses. The geese leave a mess behind. The people at Geese Guys work with their amazing dogs to herd the geese to keep them moving, so there’s less mess in their wake. I recently spoke to Kristen Grompone, President of Geese Guys, and she says it’s like geese are the new sheep. Geese Love Portland: There are a lot of geese in Portland. Portland hosts migrating populations of geese, who pass through the area in spring and fall. Some geese like to stay for the winter in Portland before moving on in the summer. Other geese are part of resident flocks who call Portland their home all year. As tundra birds, they seek out large, grassy areas and congregate in the open spaces they find in Portland and the surrounding area. Goose Mess: Each goose can eat 3-4 lbs of vegetation a day and can leave behind 2-3 lbs of droppings per day. That’s a lot of droppings! Imagine even a small flock of geese taking up residency in your neighborhood elementary schoolyard and the mess they naturally create. Naturally, school administrators see this as a problem and want the geese gone. So do the managers of golf courses, cemeteries, parks, and other large grassy areas where the geese gather. Bring In the Dogs: Geese Guys has a solution for humanely managing these geese populations. They have joined up with 11 Border Collies to herd the geese into more movement. The geese see the dogs as natural predators. Once the geese spot the dogs staring at the them, the geese pack up and move on. Geese Guys brings the dogs into an area a few times a day to keep the geese from settling in. Dog Days: The dogs absolutely love this work! 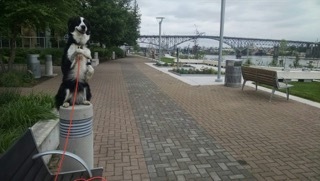 Border Collies are herders and live to work like this. They enjoy getting out in the field and pretending to be a predator. The dogs are all also pets, living with the owners or employees of Geese Guys. Geese Guys also trains its dogs. Kristen is a dog trainer, with degrees in biology, animal behavior, and environmental leadership. She and the other trainers use positive reinforcement techniques with the dogs. These dogs are happy dogs. Geese Smarts: Kristen says geese are smart. They learn to recognize cars and schedules. So the dogs show up (with their handlers) at the areas at different times of the days, and sometimes with different cars. Another trick they use is a laser pointer with a green beam of light. The geese see the light and believe a predator is heading across the areas. I asked about inanimate objects like scare crows. Geese are too smart for them. Dogs To The Rescue: Geese Guys started in 2011. The founder, James Kuri, liked to golf, but encountered the goose dropping problem on the links. He purchased a trained dog and cleaned up the golf course in exchange for free golf. Kristen joined the team in 2012, and brought along her dogs. Now, Geese Guys has more staff and is servicing 30 properties with 11 dogs. A Day’s Work and Play: Kristen says the days are long – well maybe not for the dogs. She takes her dogs out early as the sun rises, and then heads back to the same property again in the evening as the sun sets. She makes her rounds throughout the day to several properties. During summer, those days are long, but she has quiet times in the middle of the day, she says. Restoration: Geese Guys also use their dogs to manage sensitive areas like wetlands. They use the dogs to manage the geese population to help the wetlands recover from damage. Once the wetlands are flourishing, the geese can come back at will and have a natural place to call home. Kristen says their mission is also about education – to create a tolerance for sustainable methods of wildlife management. 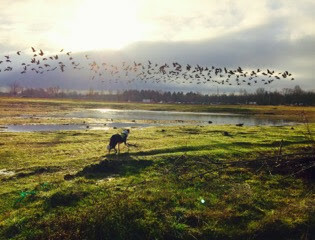 Coexistence: Geese Guys are the only business in Oregon using dogs to manage geese. Kristen says they manage properties as far north as Vancouver, Washington and down to Wilsonville. They are, she says, providing a service and a way for us to coexist with geese. I was so curious about this business. Thanks for the brilliant article. I'll never look at the golf courses around town the same.